Here are a few easy tips on how to deal with makeup fall-outs. Now sort your life and look stunning by taking simple preventive steps. You don’t have to be a pro for a fabulous looking makeup. Just a few tips and tricks here and there and you’re sorted. Today Zuri brings to you some tricks to deal with makeup fall-outs. Fallout with regards makeup refers to an excess amount of product that falls off of the designated area. As they say, “prevention is better than cure”, so most of these tricks are preventive ones, to be used before the fall-outs actually happen. 1. Eyeshadow: Eye shadow fallout is by far the most common problem all of us face, wherein specks of eyeshadow fall and land under the eye when doing eye makeup especially smokey eyes. The best way to do away with eye shadow fallout would be doing your eye makeup before applying foundation. This way you can easily clean the face when your eyes are done. But if you’ve already applied your base coat then the easiest fix to this problem would be putting a veil of loose powder under your eyes. This way the pigment will fall onto the powder. 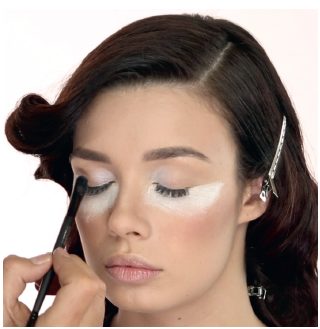 Now when you’re done with your eyes, simply sweep away this powder with the flick of a clean brush. This will brush away all the eye shadow pigment without interfering with the foundation. Using a scotch tape can also be of help when you want to get rid of any eye shadow glitter particles from under your eyes. But make sure you don’t press it too hard. Just tap the sticky side of the tape under your eyes to pick up any glitter fallout. And the best part is that it doesn’t even disturb the foundation already applied earlier. 2. Lips: Are you one of those people who duck into the restroom to check on your lips after a meal or a glass of wine? Lipstick bleeding and feathering is one of the biggest makeup mishaps that we come across. Don’t fret, here are a few tips to take care of that seductive pout and keep your lipstick where it belongs. Use a foundation as a primer for your lips before applying lipstick to help it stay put. Seal the foundation with some loose powder to help it stay in place. Next pick up a lip liner and sketch an outline around your lip line. This will act as a barrier to stop your lipstick from seeping out. Going for a long stay, transfer resist lipstick can also be of great help to fix bleeding lips. Don’t forget to check for lipstick on your teeth. It is one of the biggest makeup faux pas and can be really embarrassing. A tissue can fix this problem. 3. Kajal: Eyes are the mirror to the soul. And the quickest way to accentuate your eyes would be by using a kajal pencil. Just a single stroke and you’re sorted. But a smudged kajal can turn even the loveliest of goddess into a black-eyed raccoon. So here are a few tips to fix smudged kajal. First and foremost make sure that your skin is oil and sweat free. Most of the times, it’s not the kajal that goes runny, but your oily skin that causes it to spread and smudge. A quick tip would be rubbing an ice cube around your eye before you apply kajal and let it dry naturally. This will help you get rid of any oil buildup that can later cause it to run. Choosing your kajal wisely can also make a difference. Go for a long stay, smudge proof one. A variety of them that can last up to 12-15 hours are available in the market. If none of the above seems to work for you and you’ve ended up with smudged kajal, then cotton buds can come to your rescue. Just dab a drop or two of face toner or the good old Vaseline on the bud and with a gentle stroke, wipe the smudge off your eyes. 4. Nail Paint: Haven’t mastered the art of applying nail paint and often end up messing up the skin around your nails? Don’t worry! Just rub some petroleum jelly like Vaseline on the skin around your nails before applying nail paint. This creates a barrier between the polish and your skin so that you can easily wipe off the Vaseline and along with it any excess paint off your skin after you’ve painted your nails. So these were a few tips to handle some of your most common makeup issues. Use these tips and say goodbye to makeup fall-outs.